Want to know the secret behind building a successful blog? Content. Yes, you heard it right! Content is the essential factor that plays a vital role in placing a website or a blog in the topmost status. Writing viral posts with unique content is not just sufficient but, the fundamental element is that the content you’re writing must be error-free. Most of the proficient bloggers build efficient blogs that worth million-dollar online businesses just by writing alluring blog posts. It is possible only when you post articles with genuine content. It is the universal fact that “Content is always King”. Writing powerful blog posts is the key for driving more traffic, enhance social shares and boost your online income. If you are not a proficient writer, it is really challenging to write impeccable content. Are you an aspiring writer? Whether you are a blogger or writer, regardless of your field, you have to make your content more understandable with proper grammar. To attain best results, you must be pretty vigilant about your writing. It is so simple to grab a computer and begin writing some kind of stuff, but writing error-free content certainly needs exceptional writing skills. You need to make sure that your grammar is accurate and there are no typos in your content. If you struggling hard to build your blog in a more enhanced way with rapid growth, then you must start working sternly with your writings in a more improved approach. The more dedicated efforts you put into your blog and writing, the better outcome it will render. If you need advanced suggestions and beneficial tips for improving your grammar in your writing then you need to begin using a professional online grammar checking service to deliver your content on your blog post in a flawless way. There are bounteous grammar checking services available online, but we only bring you best of the best. I have compiled a big list of 10 best online grammar checking tools that help you write content without any typos or grammatical mistakes. Let’s get into the article! Grammarly is the most reliable grammar checkers available in the market right now. It is a great grammar checking tool that totally analyzes your writing and brings you suggestion to make it even better. If you are an ambitious writer then check your writing using Grammarly before posting it. Grammarly works in real-time in the best way when you start writing. This tool keeps offer you proper suggestions along with synonyms that relate to your words and corrects your errors right beside your typing. Grammarly is the best online tool which is available as an extension for all the popular web browsers including Google Chrome and Mozilla Firefox. The extensions assist you in the best way to make use of this service with much efficiency to monitor your writing anywhere on the web including social media such as Facebook, LinkedIn, Twitter, etc. Grammarly can be used by anyone at free of cost. This tool has excellent features that check some writing styles. Grammarly has an advanced plagiarism checker that is capable enough to check copy traces if any. It even provides proofreading services alongside grammar checking. You can use Grammarly in MS-Word document with much comfort. 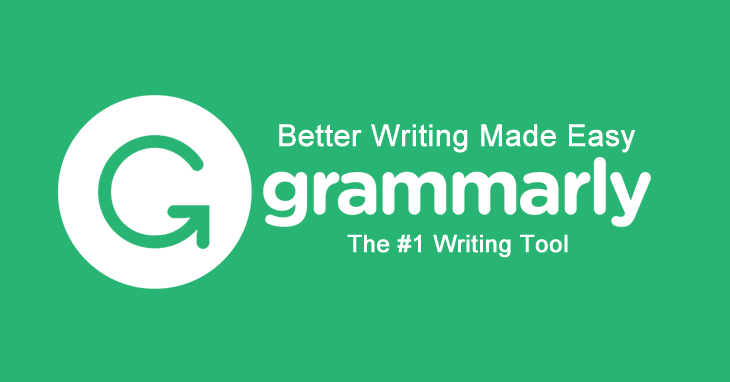 Grammarly is a tool which is based on a high-performance grammar checking concept. White Smoke is the preferred tool for most of the writers and bloggers who wishes to use a proper and most advanced online grammar checking tool. You can use this tool on your PC and mobile phone simultaneously but, all it needs is simply an internet connection. WhiteSmoke is typically designed for use with PCs, smartphones, tablets and can also be used to work with any platform using text boxes. 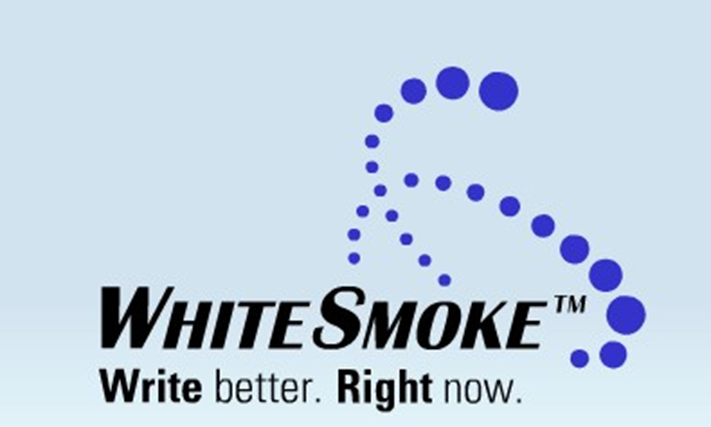 WhiteSmoke writer checks your grammar errors, punctuation mistakes, sentence structuring, and style of writing. It has a spell checker that highlights the mistakes in your content just by underlining them. WhiteSmoke Anywhere is another best feature that lets you check for common grammar and writing flaws no matter which device you have been using. It owns a strong plagiarism checker that handles any duplicate content that could probably cripple your rankings. WhiteSmoke has the capability of translating your content to more than 45 languages. WhiteSmoke comprises of a new android keyboard that prevents typos making grammatical mistakes. The Ginger grammar checker is the top proofreading and grammar checking tools. It is capable of checking different errors like contextual spelling correction, misused word correction, and many others. It enhances your writing productivity in a more productive way by offering great support. The Ginger grammar checker is available online as well as software. If you want to enhance your writing skills, just use this pretty good online grammar checking tool. This tool will allow you take your writing and text to a totally distinct level and turn it more stable. This tool is almost identical to Grammarly grammar checking tool and in terms of the features, it may even render a few additional ingredients in the free version. 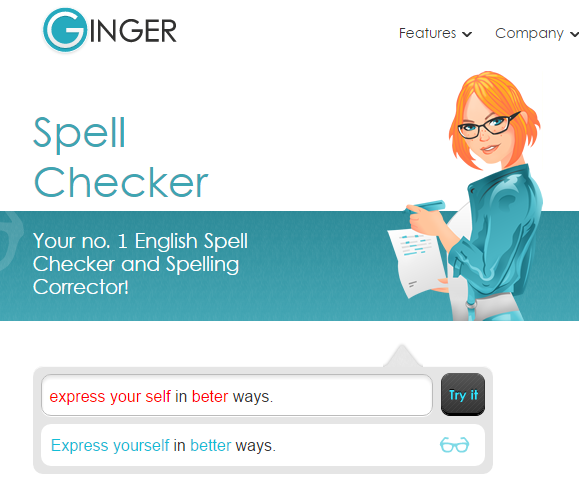 The Ginger Grammar Checker checks your sentences formation and grammar and helps you rephrase the complete sentence. It offers a text reader that reads the entire text back for you. You can then get a listener’s perspective and understand if anything doesn’t sound right in your text. Ginger Grammar Checker provides an easy translation with a simple dictionary. You can get access to a personal instructor feature that teaches you writing skill straight away from your error. Ginger Grammar tool is available for Windows, Mac, Android, iOS and other browsers as an extension. SpellCheckOnline is a free online grammar checking tool that lets you rectify simple grammatical mistakes. Through this online English grammar checking tool, you can receive more proofreading and grammar checking suggestions on its official blog as well. There is another website for grammar as far as interface is involved. SpellCheckOnline comes with a simple editing tool that helps you to trace the grammatical flaws in your content with much ease. It is capable enough to correct your grammatical typos. SpellCheckOnline not only works with English but also many other languages such as German, French, Spanish, Danish, Dutch, Italian, Polish, Portuguese, Suomi and Swedish texts. After The Deadline is one of the best grammar checking tools that is available for free. This tool can be used by the writers and bloggers. This online grammar checking tool is capable of checking your overall grammar usage, spellings along with your writing style. Upon analysing the complete text, it will bring you suggestions to enhance your entire writing by using different words and sentence structure. 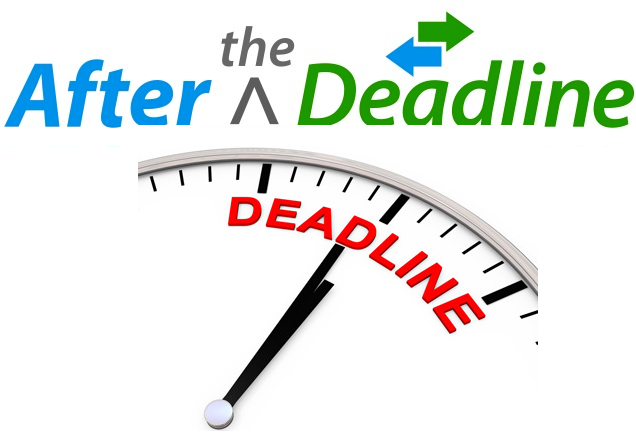 The ‘After the Deadline’ tool is actually developed by the same people who are behind WordPress and hence it is safe to assume that it will be available as a plugin for WordPress. Like other online punctuation tools, After the Deadline is also available as an extension for Google Chrome, Mozilla Firefox and OpenOffice Writer word processing software. You can make use of this tool anywhere on your device despite the platform and software you’ve been using. Just check out the demo available on the homepage of the site to see the operation of this tool. 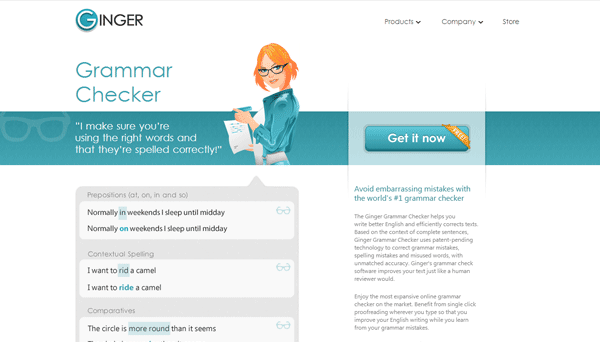 After The Deadline grammar checking tool is available for free without the need of subscriptions. If you are striving hard to write blog posts with error-free content, punctuation checker tool is the best tool for you. It’s not only a free punctuation checker tool but it helps you correct your grammatical mistakes. Using this tool, you can write error-free content as it offers automatic program assistance. Definitely, you will be able to write error-free content with appropriate grammar with perfect spelling. You can even check for duplicate contents by using this free online punctuation checker tool. Simply visit this website and enter your text over there and click on “Check your text”. It will check your writing immediately and display you all the mistakes with your writing. It offers error explanations and correction tips. This tool also provides context-optimized synonym suggestions. To get rid of plagiarism, it provides citation assistance. Note: You must enter no less than 40 words on this tool to check your text for punctuation mistakes. LanguageTool is an open source proof­reading tool that monitors all your content for any errors in your grammar and spelling. It also checks for errors in the content not only in English but also supports 20 other languages. Once you visit this website, you can view punctuation checking dialogue box along with simple proofreading that helps you correct your grammatical typos. Using an online grammar checking tool has copious benefits when proofreading the text. 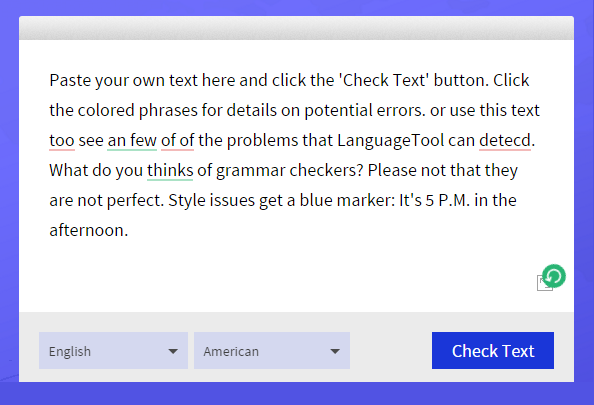 One of the excellent advantages of using this grammar checking tools is that you don’t have to explicitly install this software on your device to trace out the grammar errors in your text. Everything is online which is reliable and secure indeed, no documents are being saved or cached in this online grammar checking tool servers. Language tool grammar checking tool is available as a desktop software, open office tool, and Firefox extension. This tool can be used in more than 20 languages including English, French, etc. 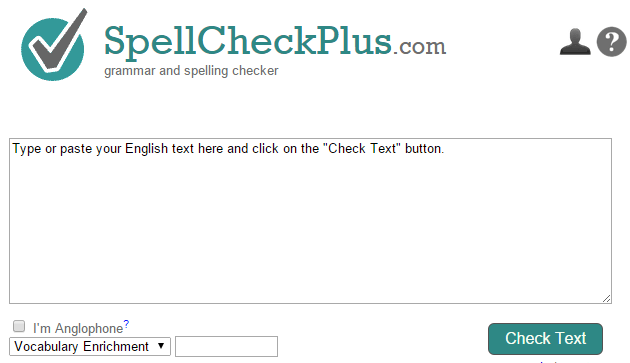 SpellCheckPlus is a free online grammar checking tool that is simple and straightforward. Actually, SpellCheckPlus does not provide as many features as Grammarly or other grammar checking tools even then, it will yet assist you to enhance your writing by rendering you with apt suggestions. It also offers you accurate word suggestions, word forms, and simple spelling suggestions in your writing. The Pro version of SpellCheckPlus is truly much better than the free version. Despite the pro version of SpellCheckPlus is not available for free as it offers way more for just $15 per year which is absolutely fair. The pro version also gets clear of the advertisements that are available in the free version. The pro version of SpellCheckPlus will offer grammar exercises to develop your grasp of English grammar. It also presents a complete review of your mistakes so that you can analyze them and learn from your mistakes. There are more features for the pro version which are better than the free version. Even the free version will help you enhance your writing with simple and candid suggestions. PaperRater is an online grammar and plagiarism checker tool that is available for free. As it is a free online grammar checking tool, you don’t have to download it explicitly. It is suggested as the best online grammar and proofreading tool for freelance writers, bloggers, and even students. To check whether your content is plagiarized or not, then just paste the text in the page. It will then begin comparing your writing with more than 10 billion documents on their server to give the best and accurate result. You will get complete statistics about word choice, grammar, spelling in your content in a detailed way. Your text will be analyzed proximately in real-time so that you can write error-free content within less time. PaperRater is one among the 10 best tools which is easy-to-use and is 100% free. Ginger is the widely used English grammar and Spell Checker tool that is available at free of cost. This top notch online proofreading checker tool corrects your typos, phonetic errors, severe spelling mistakes and misused words depending on the context of a sentence. It makes use of the best software that is capable of detecting your writing mistakes automatically to allow you write impeccable writings. It uses a breakthrough, patent-pending technology to correct any type of error, including those left overlooked by other spell checkers. Here are some important features of Ginger online grammar checker tool. These are the 10 best free online grammar checking tools that correct your grammatical typos for free and will work as your proofreading tools as well. 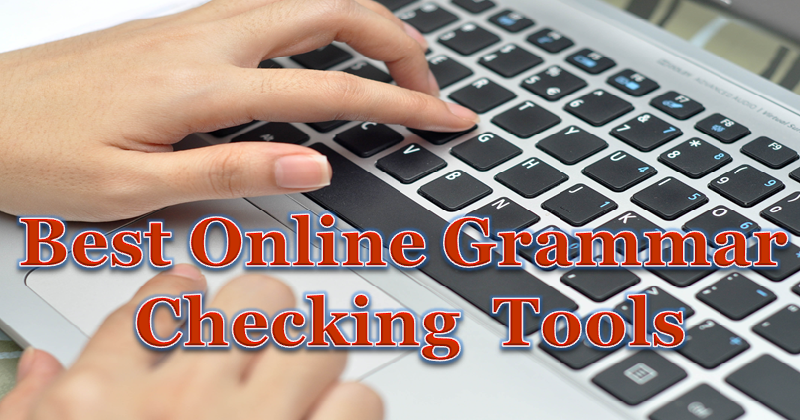 These are the most popular online grammar checking tools which I have listed out after reviewing and checking their usage in personal. Among these 10 best online grammar checking tools, I recommend you to use “Grammarly” as it is able to correct a wide range of errors which the free tools might not perfectly do. These tools are helpful for the bloggers, freelance writers, and aspiring students who have large writing projects. Hope this list help you in the best way to find out errors in your content.